Silvia Duarte, manager of the Groups and Events office of the Riviera Nayarit Convention and Visitors Bureau (CVB) was also present at the event, along with Claudia Guzmán, director of Economic Development for the Bahía de Banderas City Council. Both agreed this type of events position the Riviera Nayarit as an ideal destination for sports tourism. Duarte stressed that many of the competitors are minors and usually travel accompanied by their families, trainers, and friends, which translates into an important economic spillover for the region, not to mention the increase in hotel occupancy that occurs with the arrival of these groups. • The inauguration and flag ceremony begins at 7:30 am on Saturday, April 6th. All swimmers in all categories start competing at 7:50 am. • The circuit for swimmers 10 years and under will be a 500-meter rectangle; swimmers 11 years and older will swim a 1.25k rectangle. 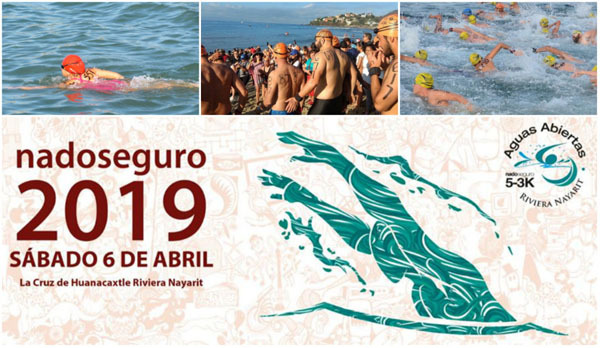 There will be two classifications for the 13-and-older categories, as competitors can choose to swim the shorter 1.25k event or the longer 3.75k one. The men’s and women’s Open and Professional categories circuit runs for 5k. • Timing will be electronic via a chip affixed to each swimmer. • The event will be safeguarded by the Navy, the Bahía de Banderas and the State Civil Defense Units, and the Government of the State of Nayarit. There will also be a private recovery section with medical personnel, hydration, and solid food. • The organizers invite the entire community of Bahía de Banderas to assist as spectators to support the swimmers. More information at Aguas Abiertas Nado Segoro.